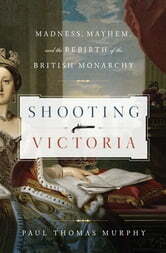 During Queen Victoria’s 64 years on the British throne, no fewer than eight attempts were made on her life. Murphy follows each would-be assassin and the repercussions of their actions, illuminating daily life in Victorian England, the development of the monarchy under Queen Victoria, and the evolution of the attacks in light of changing social issues and technology. There was Edward Oxford, a bartender who dreamed of becoming an admiral, who was simply shocked when his attempt to shoot the pregnant Queen and Prince consort made him a madman in the world’s eyes. There was hunchbacked John Bean, who dreamed of historical notoriety in a publicized treason trial, and William Hamilton, forever scarred by the ravages of the Irish Potato Famine. Roderick MacLean enabled Victoria to successfully strike insanity pleas from Britain’s legal process. Most threatening of all were the “dynamitards” who targeted her Majesty’s Golden Jubilee—signaling the advent of modern terrorism with their publicly focused attack. Excellent read. Nice insights into a distant Era with surpisingly similar issues to our own . Very flattering portrait of Prince Albert. Author does a fine job of making the sequential steps. You get a feeling about life in victorian England, the relationship between Victoria and Albert, the difference between the attacks and what happened to the assauters.